Note the Reading Nook – when no technology is allowed. A cozy, comfortable corner. I can not get through a day without reading…. I wake up and read for a few minutes and read before sleeping at night. Take Note of the slippers in the vintage suitcase on the bottom shelf in the front entrance foyers. Coupled with greenery and candles – the invitation is relaxed and cozy. The message to our guests is to come in, get your feet warm and relax. The key to organizing is a place for everything and everything in its place. Kate’s husband Jim is a great carpenter in his spare time. He filled this unused area with open space shelving to keep items where we need “finger tip accessibility” on display. Along with a few baskets, it stays neat and tidy; a good example of organizing prettily. The basket with the market bag in it on the left is my own personal “launching pad”. Throw my things into it when I get home from work and I fill it with the things I need to get “launched” for each day. I keep a few houseplants in this window which is in the kitchen. 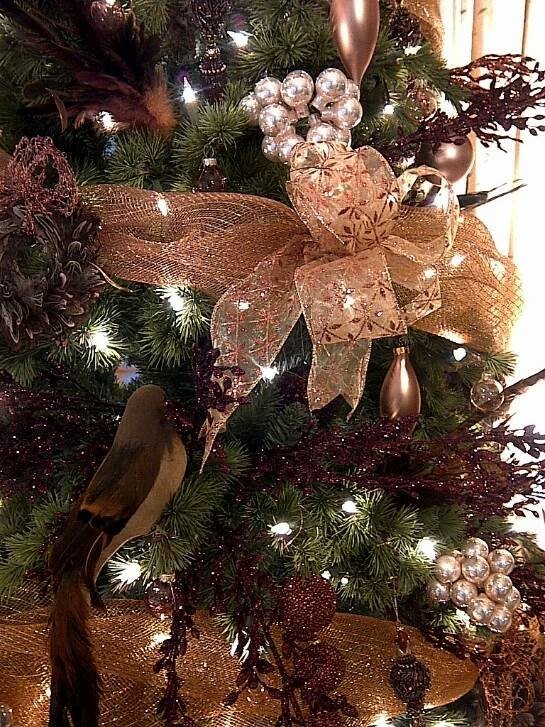 I see them each day and they do “spark joy” as well as oxygenating the room; so important during the winter months. When you can not store – display! Our kitchen is the hub of our home but the truth is, it lacks cupboard space. We used this vintage shelving unit (an old paint cupboard from my in-laws garage which was given a sanding) to store our cookbooks, serviettes, easel for cookbooks, and aprons. Visually appealing, it stores frequently used items in the kitchen for ready “fingertip accessibility”. Along with our serving boards, this has become a very handy storage unit. Fingertip accessibility just means knowing where your stuff is at a moment’s notice! Hallmark of an organized home. In a kitchen with limited counter space, we got the clutter off the kitchen counters by creating a coffee bar this winter. So handy! Communication Command Central: Calendar, a mail catch-all, gift certificates and a message board at the entrance to the Mud Room as we enter from the garage. Even with the kids grown and gone, this Communication Centre helps us so much. 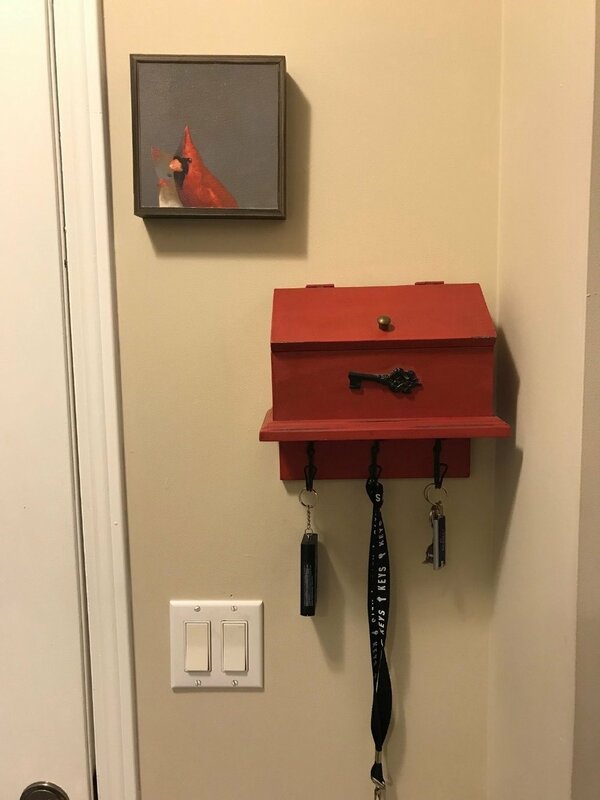 Key and Mail caddy in the Mud Room. We use the little red mail box to contain any letters that need to be mailed and we can always find our keys! Fingertip accessibility for knitting…cozy winter pastimes! While I watch Netflix, I usually knit. It makes me feel less guilty about my Netflix addiction. Fairy lights are also a Hygge essential. I am not a fan of lights strung in windows but I love using these bottle lights. 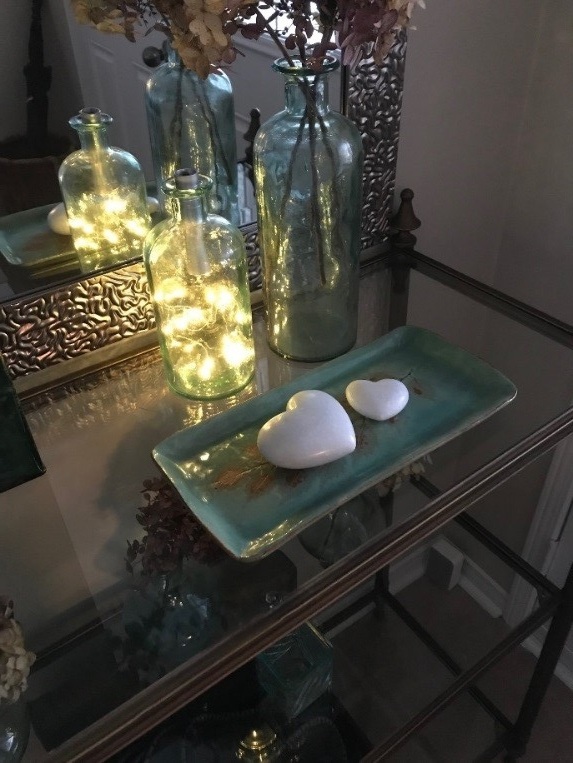 Decorating your home with nature-base elements is a great Hygge practice. I found this amazing wall-sculpture last year at the Peterborough Garden show. It is made of driftwood and a painted stone. Jim and I are both pretty much obsessed with both wood, stone and bears so this makes us both happy. This shelving display comes alive each evening with battery-operated Real Lites. The glow of the candlelight is a wonderful welcome home when returning from work on a wintry evening…and during dinner parties. We have become avid Hygge entertainers. Our dinner parties have changed from elaborate, gourmet affairs to comfort food and board games. We have found that our guests stay longer as they are even more relaxed.